In his foreword to this excellent PDF book, Air Force historian John F Kreis notes that most histories of air warfare revolve around the actual combat, and far too few if any examine the issue of combat support or, as he does in this volume, air base defense. The author believes that this is an oversight, and I would agree. Some of history’s more renowned tactical air commanders, most notably Air Force Major General Claire Chennault, commander of the Flying Tigers and later the 14th US Air Force in China in World War II, were late to discover that their ignorance of the challenges and necessity of air base defense undermined and sometimes erased their successes in the air. It was almost as if, once liberated of the ground, these otherwise fine aviators and leaders forgot that it existed. In this comprehensive (if not exhaustive) tome, Kreis examines the entire topic of air base defense from the perspective of all the countries involved in combat, starting in World War I, and running all the way through the Vietnam War. Despite hints that the air arm has learned its lessons about base defense, the author suggests that there is still more to be learned. Indeed, if the recent experiences of the US Armed Forces and NATO in Afghanistan are any indication, air base defense remains as vexing as ever for both air and ground commanders. This book belongs in the library of even the casual military historian. Historian Bernard Nalty gives us a look into the way the air war in Vietnam changed after the Tet Offensive in 1968. His selection of dates is not arbitrary. 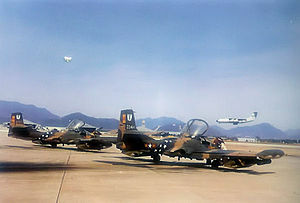 The growing opposition to, politicization, and micromanagement of the war after Tet, as well as the shift of operational responsibility to the Republic of Vietnam Air Force (RVNAF) changed the way in which the air war was conducted, and arguably gives a preview of the challenge faced in air warfare in our current conflicts. Keep in mind that this is a service history, published by the U.S. Air Force. Political considerations and bias do enter the report and should be accounted for. But this makes the candor with which Nalty examines a few of the less flattering aspects of the period – the drugs and personnel issues, the over-extension of the B-52 force – the more interesting. It is also worth noting that while Nalty’s aim is to tell the story of the air war, he does not limit himself, and provides a great deal of context and general history. As such, this book is a worthy addition to any library on the war. On May 21, 1982, four retired U.S. Air Force generals – James Ferguson, Robert M. Lee, William Momyer, and Pete Quesada – sat down at a table in the officers’ club at Bolling Air Force Base and took a hard look at the lessons they and the air service had learned in the course of their careers. Free of the constraints placed on serving general officers, the four have a far more frank discussion than they would have had while in uniform, and through this pdf book the reader gets to be a fly on the wall. You can feel the ghosts in the room: Mitchell, Spaatz, LeMay, Chennault. A superb and fast read, and oral history at its best. As the ground war in Vietnam was handed over to local Vietnamese forces as a part of Richard Nixon’s “Vietnamization” strategy, the leaders of the Republic of Vietnam could still call on a substantial U.S. air contingent to support operations. This book is designed to prove the necessity of air support to ground operations. In this it succeeds. Where it has appeared to fail is in convincing the leadership of the Department of the Air Force to shift focus to air support and interdiction instead of the Cold War imperatives of air superiority and strategic bombardment. A subtle and thought-provoking read. An oral history of aerial interdiction during the U.S. Air Force’s three largest conflicts of the 20th Century, delivered by three of the period’s most decorated generals. The unspoken lesson of this volume of history is that when you try to fight an insurgency with airpower alone, you wind up pulling in significant ground forces to defend your forward bases. Forward-deployed, land-based air forces, therefore, create a much larger footprint than might be desirable in a given situation. This issue is more than simply an historical curiosity. In addition to affecting operations in Iraq and Afghanistan, it bears a growing influence on America’s short-term and long-term overseas basing challenges. Political considerations closed US air bases in the Philippines, and will eventually close air bases in Japan. And against the global terrorist threat, large military installations everywhere become targets that demand a higher degree of defense than ceremonial guards and rent-a-cops. A growing portion of every country’s defense budget will be going to base defense in the coming years, and this early study gives us an overview of how the challenge has developed and a glimpse at what armed forces will face. A pdf book on the U.S. military and the Wild West. It is terribly convenient in these times to forget the positive work that was done by the Army and Navy during America’s westward expansion. We tend to focus on the negative, and in so doing forget that the surveyors, explorers, scouts, and lawkeepers that enabled the frontier wore Army blue and Navy white. This book, the proceedings of a symposium at the U.S. Air Force Academy in Colorado Springs, seeks to re-examine the military’s role in the opening of the West.